I’ve decided to change to a new blog posting schedule, once per leap year. It’s slightly less often than my one twitter per year policy. In any case, if you’re interested in seeing what’s new with me on a more frequent basis than my blog updating schedule, I’d advise checking out my Flickr or YouTube accounts. After events nowadays, I’m more likely to drop pictures and videos directly into those accounts rather than posting a writeup here. I do still plan on posting the occasional event though, such as the future Dancetown related talks I’ll be giving in the Pittsburgh sometime next month. If you want to try to guilt-trip me into writing more frequently, give it your best shot in the comments below. Via Slashdot, I came across this great survey of the first gaming experiences of prominent journalists and heads of gaming companies (unless you’ve worked in the industry you’re unlikely to recognize any of the names, but trust me, they’re influential people). One common thread that I noticed amongst many of the responses was that several of them were first introduced to gaming by their fathers, which is also true for me. While I’m not sure of the exact game, I know that it was definitely my father who showed me my first DOS-based game shortly after buying our first family PC. I want to say the first game I played was Frogger, but I also have memories of primitive golf games and several variations of Tetris (which my father used to be obsessed with when it first came out). I also have fond memories of the whole family gathered around the PC playing multiplayer Monopoly and being totally unaware that it was based on a board game. However, from the start of the nineties till just recently, my folks stopped playing computer games altogether (and were barely aware of the rise of console gaming). But just within the last year or so, they’ve gotten back into casual games for the PC and Nintendo consoles. I’m not sure exactly why this is. Part of it is that game developers are finally addressing some of the needs and interests of a more mature, busier type of gamer with software like Brain Age, Wii Sports, and Wii Fit. At the same time, the demographics of gaming are getting wider with games like Nintendogs (which has universal appeal because who doesn’t love puppies?) and World of Warcraft (which just passed the 10 million subscribers mark), both of which encourage intergenerational play. However, what about the almost two decades of game development that these casual gamers missed out on? When you jump from 8-bit monochromatic into haptic photorealism are you in for a shock? Or is gaming finally returning back to its roots with easy-to-learn fun and simple gameplay (with Wii Tennis basically being a modern day version of Pong)? I’d be interested in hearing about others’ experiences with this phenomenon. What types of games do you play? Do you ever play with either older or younger generations? What sorts of games do you think promote intergenerational play? This weekend, at the monthly board meeting of a local Asian-American association I serve on, we decided to finalize our integration with a similar, larger national organization. As Technical Director, I have to revamp our old site to match the basic guidelines of the national organization (which they seem pretty flexible on except the logo). Since the old site is around five years old now, it’s outdated enough that I’m thinking about just rebuilding it from scratch to fit our group’s needs better. Like many professional organizations, we tend to be very event focused, spending most of our efforts on organizing, scheduling, and announcing future events or recapping past ones. Because of this, I’m inclined to try a blog-style format, which seems to work well for the Cincinnati chapter. I also serve on another local IGDA board and we’ve had good results using a very simple, events-driven blog format. In fact, I think the IGDA actually sets up Movable Type blogs for most chapters nowadays. 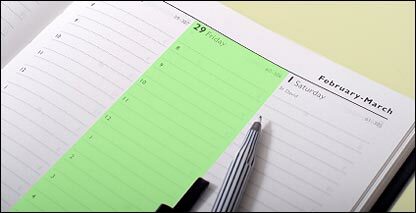 So right now, I’m thinking a simple WordPress blog with calendar and RSVP widgets. This will also let us integrate our group Flickr streams and social network hubs in a more seamless fashion. Plus, by setting up multiple author accounts, event organizers can announce events on the site themselves, rather than having to go through me or wait for the monthly email announcements. Anyone else have experiences doing rebranding or redesigns for professional organizations? What are your thoughts on the blog format as opposed to the more traditional brochure style some groups still stick to? Feel free to share your success stories (and glorious failures too)! For 2008, I’ve decided to revamp the look and feel of this blog into something simpler and cleaner. While I received lots of positive feedback on the original design, it was a bit lacking on the usability side. While some people found the pull down menu to be a clever little gimmick, a few people didn’t even notice you could pull the top menu down, making navigating the site much more difficult for them. Plus, the previous design wasn’t very widget and add-on compatible, not even supporting basic things like a blogroll (which is why mine is somewhat lacking now) or tags (which should be fine since I habitually tag posts anyway). So hopefully you’ll like the new look of the site. I’ll slowly be adding more functionality and polish, so feel free to leave feedback and recommendations for widgets to add. I especially could use some feedback on the new logo. On the left, you should see eight logo mockups I quickly whipped together using some vector art and fonts. Out of these, which do you think looks best and fits the theme of this blog? You can leave general comments on this post and comments on specific logos on their respective Flickr page. Finally, since I know several of my readers are skilled artists, feel free to refine one of my designs or create an entirely new, better one (which should be easy since I’m a terrible artist). And if you’re not an artist, just leave some feedback (be gentle please). Gamers Give Back was a great success. We raised over $1000 for the Childrenâ€™s Hospital of Pittsburgh. Also, I think the 40 some people who attend had lots of fun in the gaming tournaments and got some great deals on used games. I forgot to bring my camera, so I didn’t take any pictures, but expect some to pop up on the PIGDA photo pool soon. In somewhat related gaming/charity news, playable versions of the games developed during XO Laptop Game Jam I participate in last month are now available to be downloaded. Our friend, Mike Woycheck, has finally launched his local clothing line, WearPittsburgh.com. If you’re still looking for great holiday gifts, I highly recommend their shirts for both locals and Pittsburgh expats alike. As for local events, unfortunately, I wasn’t able to attend last week’s Geek Night or CMU BVW Show. However, it looks like there will soon be video of the BVW Show online in the near future. I was able to attend yesterday’s Olympus Event at CMU, which Norm has already written about. I’m still digesting my thoughts, so I’ll post my thoughts about the event later. Plus, I’m feeling a bit of pressure from Lenore Blum to somehow top the popular Bob Dylan’s Olympus Summary video. Since I’m now a contributor to IHeartPGH.com, I’m thinking about reducing the amount of local events coverage I do here and shifting it over there. I’d also appreciate any feedback people have about what sorts of posts they’d like to read on this blog. It’s the holiday season right now, which I like to think is more than just an excuse for rampant consumerism and gluttony. It’s a season of giving, not just receiving. So in that spirit, I hope you’ll join me for a fun charity event this Saturday. I’ve mentioned it briefly before, but now all the details are finalized in flier form (see above). I’ll mainly be helping out with the charity yard sale of old games and consoles, but I’m also up for forming a Halo or Unreal (but not Guitar Hero since I’m terrible at it) team of local bloggers if people are interested. I’d also appreciate it if people helped promote this event by blogging, emailing, twittering, or good ol’ fliering. 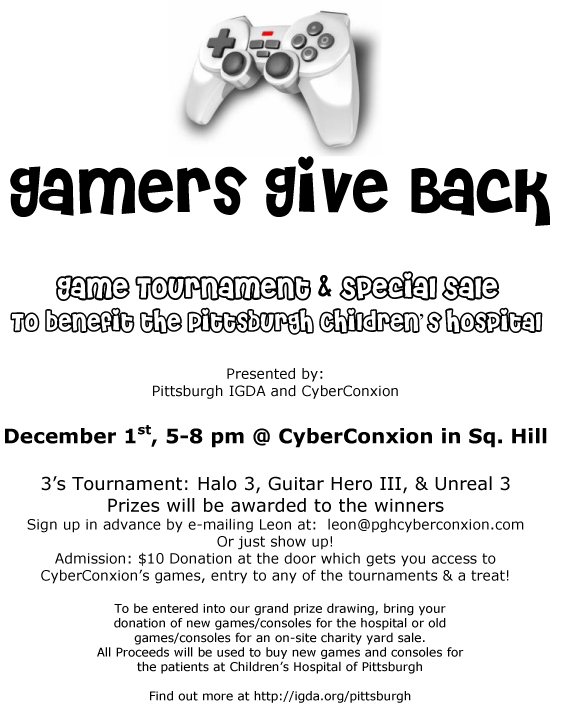 It’s for a good cause (Childrenâ€™s Hospital of Pittsburgh) and it should be fun. Also, if you can’t make the event, you can always donate directly by buying something from the hospital’s wishlist or if you have something for the charity yard sale and can’t drop it off, contact me and I’ll pick it up. And speaking of the charity yard sale, is anyone interested in seeing a preview of some of the items for sale? I’ve got several boxes of old playstation, dreamcast, gamecube, and gameboy systems, games, and accessories that I found in storage during Thanksgiving. Since I have to sort, price, and make a list of them anyway, I thought I might as post them here as a teaser. Plus, just like a real yard sale, I think old possessions give some insight into the owner, so you might learn something new about me. Starting tonight at 6 PM, I’ll have two days to create a game from scratch for the XO laptop at the Pittsburgh Game Jam. Since these laptops are primarily being distributed to children in developing countries around the world, I’m going to try to make something that’s both fun and educational. So I’ve been thinking about what games I enjoyed and influenced my educational development when I was a child. If you’re around my age and also attended US public schools, you probably have played my top pick, The Oregon Trail. There might be some stubborn Carmen Sandiego or Number Munchers fans out there, but I think most will agree that Oregon Trail (OT) stands out for many reasons. First of all, given its premise of being a historical simulation of slowly migrating west by wagon as a pioneer in 1800s, you’d expect the game to be pretty boring. On the contrary, it was probably the most exciting game available to kids in computer labs at the time. Despite being a “children’s” game, OT was brutally difficult. You died. A lot. Oftentimes from tragic accidents (usually your own fault somehow) or horrible diseases (random and sometimes amusing, for example: “You have died of dysentery!“) And in case you hadn’t quite realized the severity of your failure yet, a morbid graphic of a customized gravestone would appear to reinforce the message. Actually, it reminds me of NetHack, only instead of just guiding one character to their likely upcoming death, you get to lead a party of four, which you also get to name! So, of course, kids enjoyed naming their characters after their classmates (”Hey, Bob, you just got cholera and broke your leg, I bet you’re a goner for sure!”) or obscenities they hoped the teacher wouldn’t notice. Still, most of the game was centered around building practical problem-solving skills as your party struggles against Mother Nature, random events, and a dwindling food supply. It’s this last challenge that actually helped me understand why buffalo almost went extinct…because they’re ridiculously easy to shoot. In OT, if you decided to hunt for your food, you could waste expensive bullets on the hard-to-hit small game animals for a meager amount of meat or you could use just one bullet to hit the giant slow-moving buffalo that gave more meat than your group could even use. Ultimately, this little mini-game was more of a test of ethics than anything else. 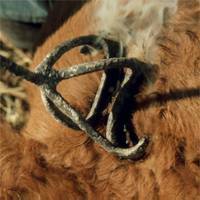 Would you practice sustainable hunting practices by shooting just one buffalo to fulfill your food needs? Probably not, since you’re just a bored kid stuck in the computer lab and this is an entertaining shooting game. Why not revel in the overkill? So horrible, pixelated scenes of the wanton slaughter of wildlife (like the example at the top) were not an uncommon sight. 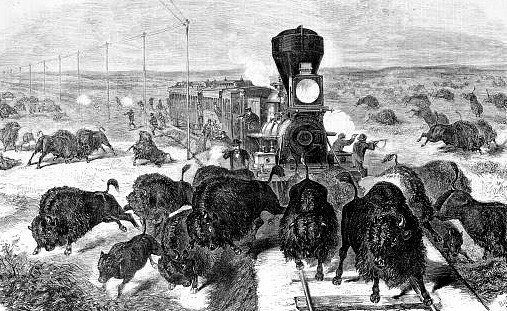 You could blame juvenile behavior for this, but I later learned that in the 1800s, people would mass-slaughter buffalo in drive-by train shootings for sport and let the carcasses rot. Well, I don’t want to make this post too long. In conclusion, playing Oregon Trail when I was an impressionable youngster taught me the horrible consequences of over-hunting (and dysentery). Has anyone else ever learned something from a game? Any game ideas, suggestions or requests for the Game Jam this weekend? Last night I went to two very well-attended geeky events celebrating simultaneous momentous occasions. Yesterday was Pittsburgh Bloggers‘ third birthday and the birth of DevHouse Pittsburgh. While our celebratory cake was not quite as geeky as the one pictured above, the room was packed and we even had some new faces show up. Jim and Lloyd dropped by since they’re working on a new web 2.0 style home renovation show, My Home 2.0, which has been shooting in the Pittsburgh area. A local TV news crew also stopped by to interview the organizers and other local bloggers. Afterwards, I headed over to the inaugural DevHouse Pittsburgh. While I enjoyed (and even filmed some of) the lightning talk presentations, I found the venue and format a bit odd. While the Rivers Club is a great venue for more formal conferences and gatherings, a high-end private business club might not be the ideal location for a self-described “non-exclusive hackathon.” While there were lots of great discussions and ideas generated, not much (if any) actual development was done. I would recommend that the organizers switch to a venue that facilitates group-oriented development better and to stretch out the length of the event beyond just 6 hours. While I think this was a great introduction of the DevHouse concept to the Pittsburgh area, I think the next event could be even better if it focused more on actual development rather than just presentations and networking. Similar points were brought up by other attendees last night and I recommended that they check out the upcoming Pittsburgh Game Jam. It takes places from November 16-18th at CMU’s ETC, with all the development being focused at open-source games for the XO Laptop (aka the $100 laptop from the “one laptop per child” foundation). It’s for a great cause and it should be a fun, productive weekend. And even if you’re not a coder, artist, or designer, you can still support the cause. Hope everyone had a fun and spooky Halloween. Speaking of scary things, let’s talk about how many new businesses and startups operate without qualified legal council or advice (smooth segue, right?). It’s been on my mind recently since attending Whitney Hoffman’s excellent “Legal and Logistical Advice for your Startup” session at PodCamp Boston. Having launched several of her own companies and earned a law degree, Whitney really knows what she’s talking about and gave great advice on common paperwork and tax-related issues many new businesses ignore or postpone. In my own limited experience, back when I launched my first startup, I really didn’t pay much attention to the finer legal, financial, and logistical details, which I really regretted later on. Of course, I had some excuses and leeway given to me since I was just a high school teenager back then, but there’s really no excuse for sloppy paperwork and lack of proper planning nowadays. For my next startup, I fully intend to provide an awesome 401K plan to additional to standard dot-com perks like unlimited caffeinated drinks/snacks. Which I why I plan on attending a legal seminar hosted by University of Pittsburgh’s Community Economic Development (CED) Clinic later this month. The mission of the Pitt’s CED Clinic is to “develop community infrastructure and create livelihoods for local homeowners and small businesses” by providing free legal representation and council. They’ve represented small businesses like Dozen Cupcakes and non-profits like the Parental Stress Center (both great local organizations that I also support). Anyway, thanks to my friend Dave Tkacik for letting me know about the upcoming seminar. Additional thanks to Daniel Friedson and Paul A. Robertson at the CED Clinic for following up with additional information. I recommend that anyone else thinking about starting up a new company locally or needing advice/representation for their existing company also attend. Registration Deadline: November 8, 2007, 5:00 P.M. Please email a brief description of your business to pitt.ced.clinic@gmail.com or call 412-648-1300. Featured Topics: Creating a Business Plan, Choosing a Business Structure, Lease Negotiation and Code Compliance, Basic Employee Issues, Raising Money, Basic Marketing and Branding. Free legal representation for qualified businesses (CED Clinic will only represent businesses that attend the seminar, pass a conflicts of interest check, and seek legal services within the Clinicâ€™s areas of practice).